While discourse about climate change increases daily in the media, we remain largely ignorant of what is happening on our doorstep in the Pacific. Latai Taumoepeau is one artist combatting this, making work for years now that focuses on the effects of this calamity in her ancestral homeland Tonga and its neighbours (read a review of Taumoepeau’s Repatriate I and II). 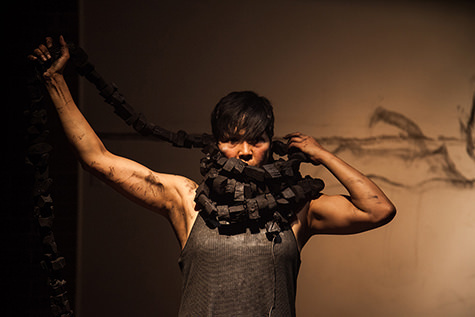 Disaffected, drawn from a concept by the work’s creative producer Katy Green Loughrey, is a collaboration with performers Valerie Berry and Ryuichi Fujimura and director Kym Vercoe, developed in residency at Blacktown Arts Centre over a four-year period. The large Pacific community in Sydney’s west was a contributing force, most notably in Sean Bacon’s accompanying video Affected, which played in the adjacent room. Affected cut interviews with residents about their threatened homelands with imagery of the three performers dancing chest deep in the ocean. Loss of country is a familiar story in an immigrant nation, yet climate causality is new. With its immersive darkness and Tom Hogan’s audio building with gradual menace, the beginning of the performance promised a dynamic experience. Moving through story, image and movement, Disaffected placed the individual firmly in context and brought emotional resonance to the issue. In a trio combining skill and personality, Berry’s account of the 2009 dust storm in Sydney was one of the most deeply affecting scenes, especially for this writer who experienced the event as images only when living overseas. Fujimura spoke of the single pine that survived from a forest of 70,000 after the 2006 tsunami in his native Japan. The pine became a sort of cenotaph, invested with so much symbolism that when it began to die, a process of preservation was embarked upon that was so costly and arduous it elicited much criticism. The pathos of the ‘Miracle Pine Tree’ was emblematised in a blue sculptural prop, garlanded with fairy lights, carried with reverence from the edge to centre stage. 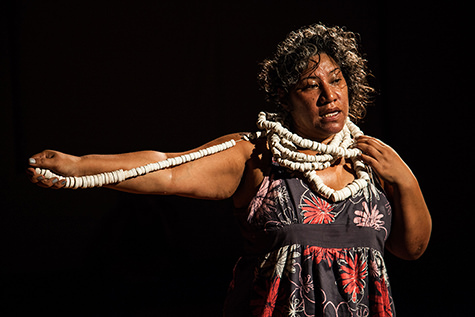 The effect of natural catastrophes on cultural materiality came to the fore more than ever with Taumoepeau’s monologue about the fabrication of long shell garlands—Beroana, or ‘shell money’, displayed in certain ceremonies. Taumoepeau used a giant ceramic replica gifted to her by artist Taloi Havini, of Bougainville heritage. This ancient blend of resource, ritual and ‘art object’ is one of a myriad that die with the environment. Taumoepeau’s great gestural gifts carried this monologue as eloquently as her words. The power of these individual stories was not matched by the recorded voiceover, partly since it provided more impersonal information, also because the production as a whole was so busy, effects overlapping one another to the point at times of swamping them. Storms were naturally frequent, Amber Silk’s lighting in turns flickering, glaucous, glowing hot and, at its most subtle, conveying empty devastation. Props such as corrugated iron and blue tarp were used to varying success. The iron, such a familiar workaday material of colonised Oceania as to be totemic, crescendoed to violent tempest in the hands of Fujimura. The blue tarps, signifying waves, were less convincing. The energy and commitment of the performers was relentless, as they shouted, wailed, ran and rolled across the floor. We sat around the perimeter of the room on mattresses and cushions, the setting reminiscent of a disaster shelter, our comfort compared to their duress making for slightly uneasy viewing. I did sometimes long for more space and reflection. The Butoh and Bodyweather training of the performers could have been drawn upon more. Viewed in terms of Taumoepeau’s single body of work on these themes, I felt the impact of Disaffected not as strong both in aesthetic and political terms. Yet that is not the main point. Disaffected is a refined and captivating piece of theatre: it should have seasons elsewhere. It is striking how much good art, from visual to performing, at reasonable prices, is going on out west—Campbelltown, Penrith, Bankstown, Casula. Once upon a time, Disaffected would have received a season in the inner city at Performance Space. This seems unlikely now. So forget Sydney Theatre Company and its $80 pageants. Check the bills of our outer suburban arts centres, consider the conviviality of a train trip from Redfern: the balance of a reasonable ticket price is sure to get you a great meal out there as well.